For most of this year, Americans have wondered when GOP presidential nominee Donald Trump would pivot into a more substantive and presidential figure. They’re still waiting for Godot, too. 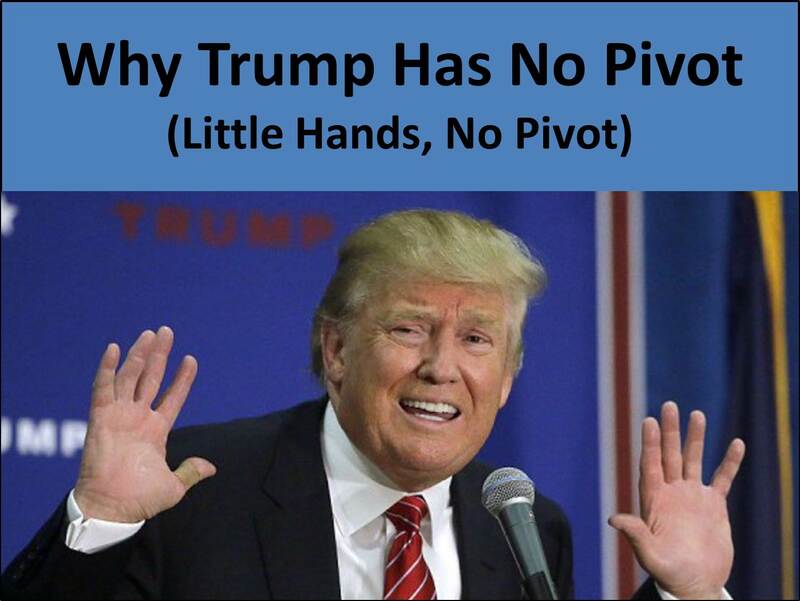 Donald Trump has little hands and no pivot. A graphic provided by Brad Thor explains the latter, though not the former. By the way, Trump’s consigliere, Ann Coulter, suffers from much the same condition. They could even be twins! This entry was posted in Uncategorized and tagged Ann Coulter, apathy, arrogance, Brad Thor, Coulter, Donald Trump, election 2016, empathy, exploitation, grandiose, jealousy, little hands, Narcissistic Personality Disorder, pivot, power-obsessed, pride, self-glory, sense of superiority, vanity on August 18, 2016 by BrotherWatch.